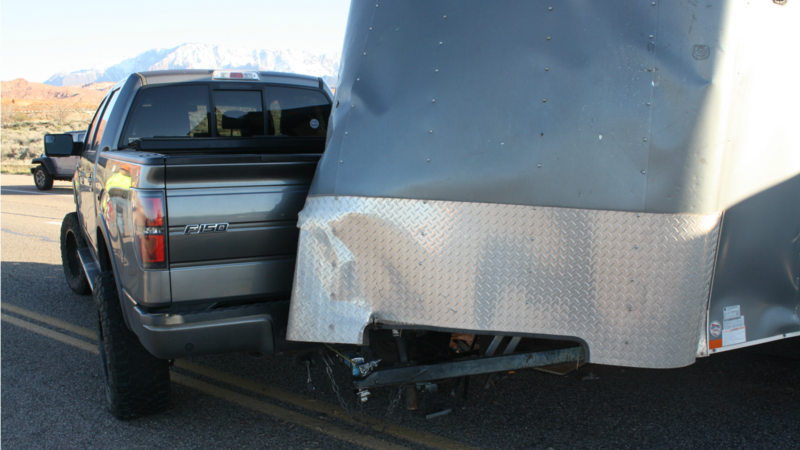 ST. GEORGE — Three crashes involving seven vehicles, including a police vehicle, occurred within minutes of each other caused a traffic backup along state Route 9 approaching Interstate 15 at the Exit 16 construction project. Shortly before 8:30 a.m. emergency personnel were dispatched to a crash near mile marker 1 on state Route 9 involving a Ford and Mazda that resulted in no injuries. While responders were tending to that crash, a second crash took place when a pickup truck was unable to stop in time and struck a Washington County Sheriff’s patrol vehicle that was stopped behind a line of cars, Washington City Police Lt. Jason Williams said. The pickup sustained extensive frontal damage while the patrol vehicle’s rear bumper was damaged, but neither driver reported any injuries. Meanwhile, a third crash involving a commercial truck, a Honda Pilot and a Ford pickup truck pulling a utility trailer took place within minutes of the second crash as the backup of traffic continued to worsen. In that crash, the commercial truck was also unable to stop in time, Williams said, and rear-ended the Honda that was then pushed into the trailer being pulled behind the Ford. “The Honda wasn’t just pushed up against the utility trailer, it crashed through the side paneling and actually entered the trailer,” Williams said. Washington City Police officers investigated all three crashes and citations were issued to two of the drivers, Williams said. No serious injuries were reported. Those with minor injuries were treated at the scene by Hurricane Valley Fire District and were not transported to the hospital. Williams also said that drivers need to slow down on SR-9 particularly where the speed limit has been reduced. He recommended that motorists traveling westbound toward the interstate keep an eye out for vehicles either slowing down or at a complete stop now that construction is well underway. “One collision snowballed all of the other ones, and it all started with one car not being able to stop in time,” Williams added. According to an advisory posted over social media Feb. 26 by the Hurricane City Police Department, a 50 mph speed limit was set in place due to the construction taking place at the interchange between I-15 and the top of the “Purgatory Hill” in the area of Trailer Source. The construction has also created a backup of vehicles heading west on SR-9 toward the I-15 on-ramp.